ThinFilmsBlog: DLC and Nanotube "Nanomattress"
In most mechanical systems, friction or vibration are often considered to be negative attributes because they results in wear and unnecessary energy dissipation. Tribological issues such as friction, wear, and vibration have always plagued developers of small-scale mechanical devices. As devices get smaller and even reach the nanoscale, this problem becomes more acute due to the extreme surface-to-volume ratios these devices have. In nanomachines damage to even a single atom layer could mean disaster. Nanotechnology researchers basically have two ways to address this problem: they either could apply traditional tribological methods by trying to integrate dampers and low-friction materials with their nano- and microdevices - which becomes increasingly complex and costly at the nanoscale - or they could try and develop intrinsic damping materials that have hard, low-fiction surfaces to lower wear yet still maintain high compressibility and elastic properties to provide resistance to vibrations and shocks. Finding materials that address these problems individually is not difficult but fabricating a structure that combines all of them is nearly impossible because of the conflicting nature of these attributes. However, in what researchers have dubbed a 'nanomattress', a unique structure containing aligned carbon nanotubes (CNTs) covered with a hard layer of diamond-like carbon (DLC) results in a carbon-based composite material with outstanding mechanical properties. The hybrid film was prepared by first growing a dense, vertically aligned, multi-walled CNT network (CNTs are ca. 7 µm long with 200 nm diameters) by thermal chemical vapor deposition (CVD) on a conductive silicon substrate. The prepared sample was then placed in a patented, off-plane, double-bend, filtered cathodic vacuum arc PVD system with substrate pulse biasing to deposit a 5 µm a-D film on the surface of the CNTs. In order to confine the coating to the top of the CNT film and prevent it from seeping through, a negative substrate pulse bias was used. 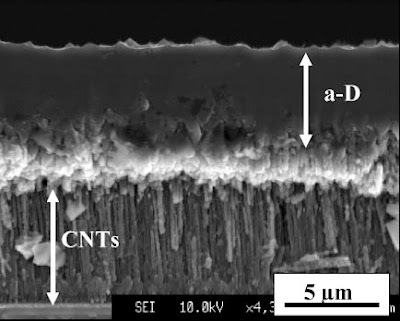 Because of the negative voltage pulse on the CNT substrate, the high-energy positive carbon ions were attracted primarily to the tips of the CNTs, forming a-D nanospheres. As these spheres increase in size, they coagulate into a thick, solid a-D film on top of the CNTs. The top layer that formed in this manner adhered very well to the tips of the CNTs, as the carbon ions formed strong covalent C–C bonds to them. With a hard, solid top, the nanomattress is now capable of distributing the forces applied to it uniformly to the underlying CNTs, which act like the springs of a mattress. There aren't words to describe how much I adore this post!!! !